Will your class escape in time? This is a review game for the letters of the alphabet. This game is to be played as a whole class, with the teacher leading the students in the game. This is an interactive game where the students are timed. They are trying to escape the pirates, and save the alphabet. You, the teacher, can decide how much time your students get to complete the task. I would suggest 20 minutes, but it is up to your discretion. You can project a timer for your class, or put one somewhere for all the students to see, so they can keep track of how much time they have left to complete their mission. This is similar to a scavenger hunt where students will be moving around the room, looking for clues to unlock their envelopes. To unlock their envelopes they will need to answer alphabet questions. At times, a paper will be needed to complete a task. Students will need a pencil to complete the tasks. For many of the questions, students must have an answer that matches one on an envelope. If the answers do not match, they can’t open or “unlock” the envelope. Once the students have solved card #1, and opened and solved the questions in the other envelopes, they will then start looking for their next clue set. This clue set will be hidden in the classroom, in a large envelope. I suggest discussing together where everyone thinks the clue is, and then sending one or two students to look for it. Other students can give suggestions on where to look. 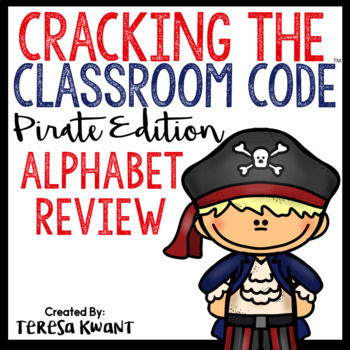 This game will continue until the students reach the last envelope and “Escape,” by getting off the pirate ship, and finding all the letters of the alphabet.